Workers attach the two-part payload fairing over the Kepler spacecraft in preparation for it March 6, 2009 launch from Cape Canaveral Air Force Station, Fla. The cover, designed to jettison shortly after launch, protects the spacecraft from the friction and turbulence as it speeds through the atmosphere during launch. NASA?splanet-hunting Kepler telescope is poised for a late-night launch tonight tobegin seeking out Earth-like planets circling distant stars. The $600million Keplerspacecraft is slated to blast off from Florida?s Cape Canaveral Air ForceStation tonight at 10:49 p.m. EST (0349 March 7 GMT) on a mission that could profoundlychange how humans perceive their role in the universe. ?It verypossibly could tell us that Earths are very, very common, that we have lots ofneighbors out there,? said Ed Weiler, NASA?s associate administrator forscience missions. ?Or it could tell us that Earths are really, really rare, andwe?re all alone out there.? Named after Johannes Kepler, the 17th century German scientist who pioneered the lawsof planetary motion, the Kepler the spacecraft is NASA?s first missiondedicated seeking out planets like Earth orbiting stars at just the rightdistance to allow liquid water - a vital ingredient for life on our own world -to exist on the surface. ?Kepler isessentially a planet-sifter for Earths,? said Patricia Boyd, NASA?s Keplerprogram scientist, adding that the mission is expected to take a censusof Earth-like planets to see how common they are in our Milky Way galaxy. ?Theanswer to that question could fundamentally shift our picture of our place inthe universe.? Astronomershave discovered nearly 340 extrasolar planets since 1995, but most of them aregas giants, like Jupiter, or larger. ?What we?rereally interested in are rocky planets like that of the Earth,? said WilliamBorucki, Kepler's principal investigator at NASA's Ames Research Center in MoffettField, Calif.
Theforecast for tonight?splanned launch appears pristine, with a less than five percent chance offoul weather thwarting Kepler?s liftoff, mission managers said. The missionhas two launch opportunities; a three-minute window at its first launch timeand another window that opens at 11:13 p.m. EST (0414 March 7 GMT). NASAdelayed Kepler?s launch by one day last week to allow extra rocket checks onthe spacecraft?s Delta 2 booster to ensure it was fit to fly. The precaution,stemmed from the Feb. 24 failure of a different rocket carrying a NASAEarth-watching satellite, found Kepler?s booster in fine shape for tonight?splanned liftoff, mission managers said. Afterlaunch, Kepler is designed to turn itsunblinking camera eye at a patch of sky between 600 and 3,000 light-yearsfrom Earth in the direction of the constellations Cygnus and Lyra. The targetzone covers an area similar to what a human hand could cover when held at arm?slength. Kepler willstare at the region for at least 3 1/2 years, measuring the light from 100,000stars every half hour with a 95 million-pixel camera to watch for the slight dipin a star?s brightness that signals a planet moving across it as seen fromEarth. It?s the equivalent of trying to spot a flea crawl across a carheadlight from miles away, NASA has said. ?Wecertainly won?t find E.T.,? Borucki said. ?But we will find E.T. ?s home bylooking at all of these stars.? Butspotting planets the size of Earth is hard work. Kepler will seek out planetsthat circle their parent stars in just the right orbit, a so-called habitableor ?Goldilocks? zone that is neither too hot nor cold for liquid water toexist. For example,last month European scientists using the COROT space telescope announced the discoveryof COROT-Exo-7b, a small exoplanet with a mass that weighs in at just twicethe size of the Earth. But whilethe planet?s status as the smallest exoplanet has caused some debate,researchers are sure the alien world orbits very close to its parent star,making the trip once every 20 hours. Surface temperatures on COROT-Exo-7b areestimated at 1,832 to 2,732 degrees Fahrenheit (1,000 to 1,500 degreesCelsius). ?If thatplanet has an ocean, it flows with molten lead,? said Borucki, adding that aplanet circling a star from too far out faces a different problem. ?Too far outand they?re too cold. They?re probably frozen solid.? So Keplerwill be hunting for planets that move across their stars, or transit, aboutonce every Earth year. Prime candidates will be ones the space telescope spotsthree times during its initial mission, mission researchers said. Kepler willscout for its Earth-like quarry from an orbit that trails behind the Earth andcircles the sun once every 371 days. While the spacecraft is designed to last 31/2 years, it carries enough fuel for up to six years of planet hunting just incase its mission is extended. ?We?re veryproud of the vehicle we have built,? said Jim Fanson, Kepler?s project managerat NASA?s Jet Propulsion Laboratory in Pasadena, Calif. ?This is a crowning achievementfor NASA and a monumental step for our search for other Earths around otherstars.? 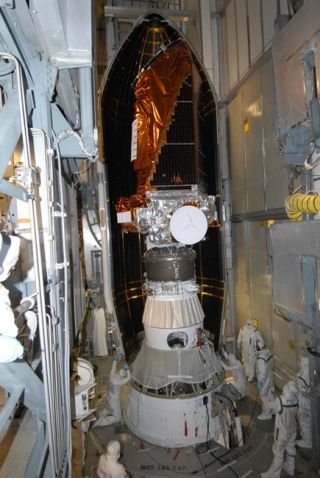 NASAwill broadcast the Kepler?s launch late Friday night live on NASA TV beginningat 8:30 p.m. EST (0130 March 7 GMT). Clickhere for SPACE.com?s live launch webcast and countdown coverage.